This year our 'Backyard' cycling has focused on the right bank Rhine plain - locally known as the 'Ried', the marshland. It stretches north of Mannheim in a 15 km wide band, bounded to the east by the straight line of the Odenwald, the clear indication of the Rhine Rift Faults. As the Ice Age ended, the Rhine flowed again but as a braided stream like many Icelandic rivers today. Sometimes great floods washed away recent deposits and the river flexed its muscles across the whole plain. In dry conditions windblown sands created a long dune chain, roughly parallel to the river, mostly left as forest today and the home of rare plants and wildlife. Along the edge of the Odenwald the early Neckar meandered slowly to join the Rhine near present-day Mainz. Early settlers lived here in remote communities, the first woods were full of wildlife including bears and only recently has more than speculative information come to life about these settlers. As elsewhere in the Rhine valley, Celtic groups were displaced by Romans, who left both written and much physical evidence behind them. They were replaced by farmers, fishermen and by religious foundations beset by wars, famines and gradual change until the industrial revolution brought rapid alteration. More wars, including those of the twentieth century have also left their mark on this apparently gentle and rather unremarkable part of the Rhine Valley. As newcomers we often learn our history 'on the hoof, or perched on a bike'. Until the local section of the Odenwald became a UNESCO Geopark most of the small town and rural history, geography and geology was known only to a relatively small number of enthusiasts. 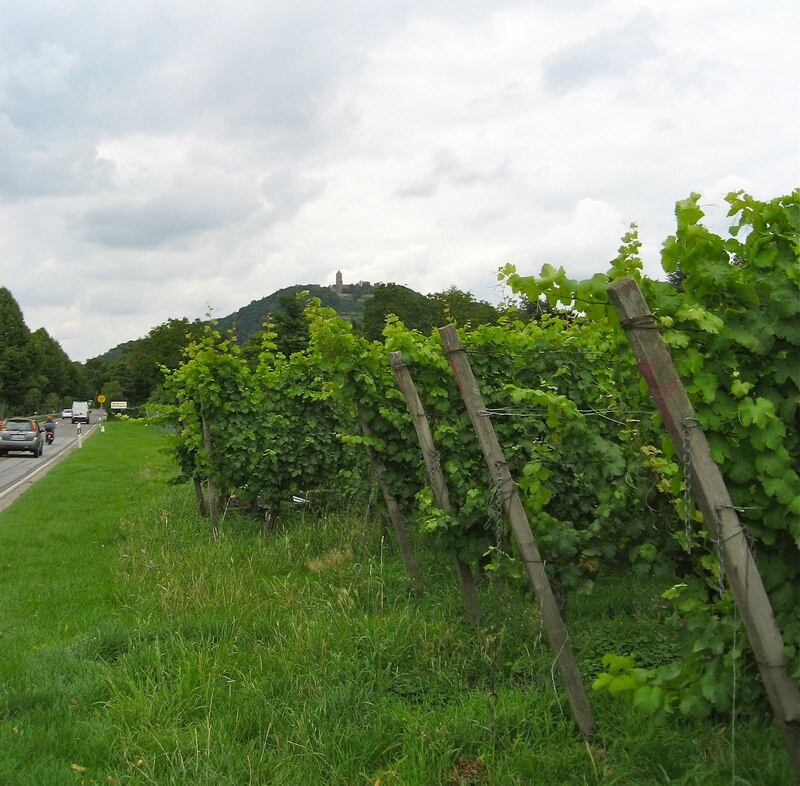 Scenically it is easy on the eye, the old towns pretty, the vineyards and orchards stepping away into the distance (see picture) but it is NOT dramatic, no Rhine Gorge, no Neuschwanstein round the corner. However UNESCO status, visitor centres, guided walks and signposted trails have increased numbers of local and far flung visitors which have had a spin-off into the marshland regions sloping towards the Rhine. These farmlands, nature reserves, little towns with hidden corners are ideal places for cyclists to stray into away from the well ridden banks of the Rhine itself. On the other hand there are some extensive unbroken forest regions, a couple of major autobahns, a few rail lines and a plethera of local and regional cycle trails, often with few directions and we've sometimes mislaid our route. We were delighted to find that the Geopark office in Lorsch, 10 km away on a known trail through the Viernheim woods, had planned and waymarked a bike route through the Ried. This would make a great club ride from Bensheim, around which town most of our members live.